Brokkolislaw or broccoli salad is a spin-off from the more famous coleslaw. Very good as an accompaniment to beef, burger or salmon. Adding crispy bacon or chickpeas can make it your own meal. Alone or in affection. This green dish is well worth introducing into the salad portfolio. The recipe I found in the fine cookbook to Ina from the inspirational blog Mat på Bordet. While Ina uses almonds, I instead chose roasted sunflower seeds. This is what most recipes have. One bases something and modifies according to taste and availability. Rinse the broccoli. Cut away most of the stems and split the broccoli tops into smaller bouquets. You can peel and cut into smaller pieces. Shake the sunflower seeds in a dry hot pan until they take color. 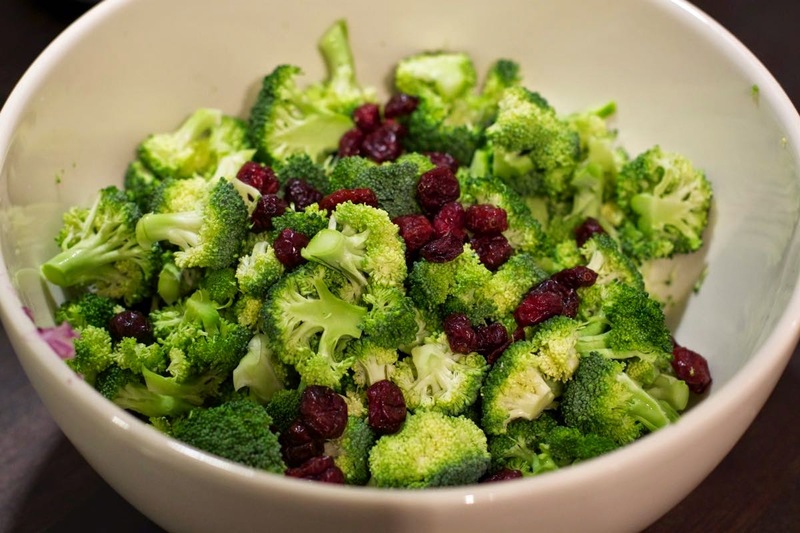 Have sunflower seeds, broccoli, finely chopped red onions and cranberries in a large bowl. Mix the ingredients into the dressing and pour the dressing over the salad. Stir. Let the salad be cool for serving, but server room tempered. The taste comes best if it gets a little.